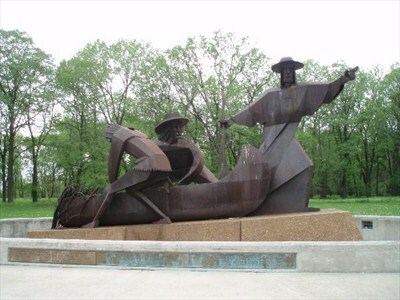 The Southwest Chicago Post tagged along for the first 40 minutes of a free walking tour of the Chicago Portage National Historic Site, 4800 South Harlem, on Saturday, June 2. Commemorative statue at the Chicago Portage. Sponsored by the Friends of the Chicago Portage historical group, the tour was led by veteran tour guide Jeff Carter, who talked about the “Birth Story of Chicago” from the geological beginnings of the Portage to how it is still functioning in Chicago today. The tour was approximately a half mile in length on a gravel path through the woods. It took about two hours. The group conducts regular tours of the site. To learn details about future events, visit www.chicagoportage.org.